If you have chosen to by Apple’s $999 flagship phone then you will certainly be looking for a protective case for it. There are lots of cases and covers available in the market for your all new iPhone X but you should choose the best security because you store all the information and memories on your Smartphone and its breakdown is not only the loss of money you may also loss the data. Here are 15 best protective cases for iPhone X which can not only protect your expensive iPhone but can also give it a funky touch. Let us begin the list with a case which is tough and make use of your iphone X easier for you. The case is a perfect combination of protection and a smart ring which you can use to hold your device well and as a kickstand. The case has already gone through a 10 feet drop test. You can get this case from Amazon. If you are looking for a case in which you can reveal the beauty of your iPhone X then it will be the best clear case. With a rock solid protection for bumper you will get clear skin which protects your iPhone X from dust and scratches. This cover also passed 10 feet drop test which is a very rare quality in best iPhone x cases. Must Read: 8 Quirky Cases For Your iPhone You Definitely Need to Try! Next best protective case for iPhone x is Caudabe Veil XT. It is a thin layer protection case which gives you the super grip on your expensive iPhone X. The cover is available in different color variants but you should not expect much if we talk about drop protection. However there is a raised strip round the camera which can protect the camera from starching on the surface which makes it one of the best iPhone X protective cases. If you are looking for a clear case which should be a little funky as well then go for Nomad clear case. Nomad makes good use of leather in its cases. Lather at the back pane gives you enhanced grip at the same time the case gives you better access to all the ports and buttons. If we talk about the drop these then the case was found tough in 6 feet drop test. What all you keep with your iPhone X your cards your money? So if you want to go for a wallet case for your iPhone X then go for Nodus. This case is made from Italian leather and you can use it as your wallet to organize your visiting cards and money at the same time tough flap gives screen the best protection. For those who want to keep there iPhone X in front of their eyes anytime Rokform crystal case is best protective case for iPhone x. This clever mounting case can be fixed to any surface. It is having magnet which can be attached to metallic surface and to glass. The cover gives you full access to all the ports and buttons. The case is also available in different color variants. Mous case manufacturer provides you a wide range of cases in leather, metal silicon, Wood and marble look cases are mostly a thin shell to protect your device. Manufacturer relies on the Airo shock technology which is known to absorb shock which makes your device more protective. Which makes it one of the best iphone x case. For such a device you may need the extra protection but you do not want your iPhone X to wear a bulky jacket all the time so here is the solution. Cover comes in 2 parts you can fix the body protection which is capable to protect it from 10 feet drop. You can also attach the bumper protection to make it resistant to drop from a 15 feet height. Here is the another wallet case for your iPhone X. The case is well crafted and suitable for your iPhone protection and can also work as wallet case. With a wide range of colors the case is suitable for both male and females. Those who want to keep their cards and money safe with their iPhone it is a perfect pick. If you are a gamer then this case from Karapax will be the perfect choice for your iPhone X. In this protective shield your iPhone X Will look like an advanced gadget. This shield gives you advanced protection. Carbon fiber highlights makes the cover attractive. If you are looking for a better protection in the lowest price then this cover will be the right choice. A case in which you can protect your expensive Smartphone and on the backplane you can also store some cards. Its leather pocket is perfect for storing your credit cars and cash. The case is thin but good enough to provide you the basic protection. Inside of the case is supersoft microfiber. Different color variants make it suitable for both male and females. If you want to carry some tools and accessories with your iPhone X then from now you should have this cover which is having Multiple tool kit which includes 26 different tools such as a set of hex wrenches, A screwdriver a knife blade and a screwdriver and if you do not need this tool kit then you can simply replace it with credit card tray. If you are a brand loyal and do not want to compromise with the apple logo at the back pane then you should choose Spigen Hybrid Armor. It is a TPU case and provides tough protection to your device. Cushing of the case is capable to protect the raised screen and to protect the camera cuts. Though you will feel the case heavy but it provides your device the best protection from a potential hit or drop. Next case is Twelve south journal wallet case which will give your iPhone X look and feel of a vintage book. It also gives your phone best 360 protection because the flap covers the screen as well. It is a classy leather cover and you can also store your cards and cash inside the flap. It is having four card slots and it can also be converted to a kickstand allows you to watch videos. For those who are looking for a funky case casemate waterfall is a perfect pick you can shake the case and can see the glitter beads dancing as you move the case if we talk about the protection the case gives you the basic protection from the bumps. It covers the bumper and edges of camera. On the front pane you will get the lift up to protect the surface from the scratches. So which case you are planning to buy to protect your $999 iPhone? 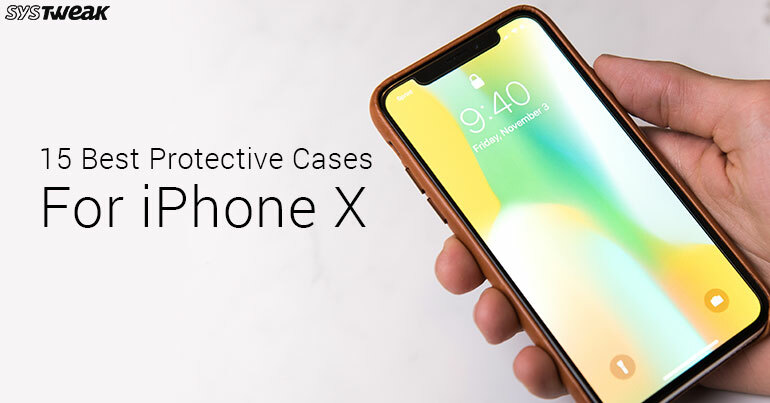 We hope this list of best protective cases for iPhone X will help you to choose the best one as it includes all type of cases. Go and grab your favorite one to protect your device and to ensure the peace of mind.